Jaina holding a copy of the report she lodged today. She was accompanied by Madius, Nelson and party members. 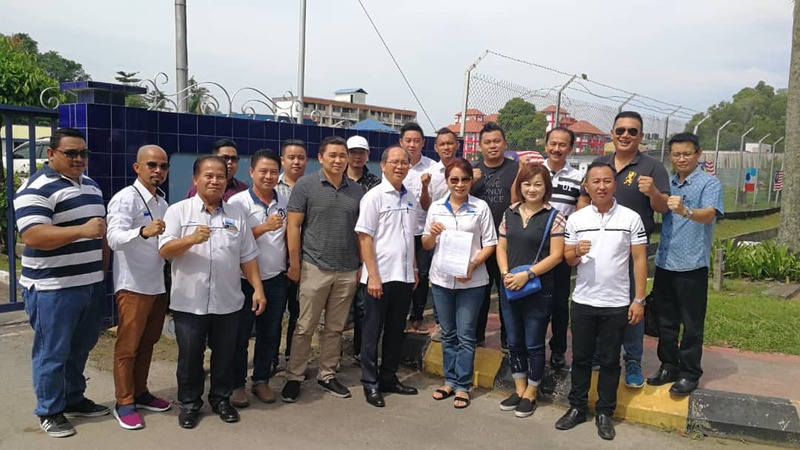 PENAMPANG : UPKO Wanita Chief Datin Seri Dr Jaina Sintian has lodged a police report against the news portal Sabahkini2 for allegedly slandering her through its article titled ‘Isteri Timbalan Ketua Menteri arah UPKO serang PBS guna isu Hudud’. Jaina said the article was meant to discredit her and tarnish her name as well as to incite the public’s anger against her. When met after lodging the report at the district police station today, she said she hopes the police will find out who is responsible for writing the article and take deterrent action against the individual. “The writer of the article made it out to seem like I had made such instruction but this is not true. This is a manipulation of the facts and slander.,” she said. She also lamented the fact that the writer or portal failed to contact her for confirmation before posting the article online. “I urge the police to investigate and find out who owns the portal Sabahkini2, where is the portal hosted, who is the reporter who wrote the article, why Sabahkini2 did not get the facts verified before publishing it, what is the actual intention of Sabahkini2 for publishing the article and if the portal had commit any offence for publishing an unsubstantiated report,” Jaina stressed. She is off the opinion that the article was aimed at tarnishing not only her reputation as the wife of Deputy Chief Minister Datuk Seri Panglima Wilfred Madius Tangau but also his name and reputation. She also said that she was informed of the Sabahkini2 article last night. Jaina was accompanied by Madius, her lawyer Nelson Angang and UPKO members.